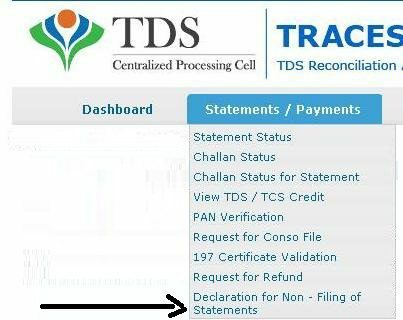 A new facility has been started in TDSCPC website to update declaration for non TDS filing for deductors. Deductors can update status of TDS/TCS statement to non-filing online after login at TDSCPC website. The benefit of this facility is that instead of filing nil TDS/TCS return for a particular quarter/period, one just need to update the status to non filing of return. After updation of status, TDSCPC website server will not sent any notice for non filing of TDS return. Note that as per income tax rules, nil eTDS statement is not mandatory due to which, the department is not able to find out the difference between the following two types of deductors. Deductors required to file return but not filed. Deductors not required to file return. After getting updation of status through this facility, department can get the details of wilful defaulters. 2. Go to “Statement/Payments TAB after login >then declaration for Non filing of TDS statement (as shown in the picture below). 3. On click of declaration for Non filing of TDS statement link you will get screen as shown below. Select reason for non filing of statement from drop down menu. 1. Fields marked by asterisk (*) are mandatory. 2. ‘Specify the exact reason’ field will be mandatory if user selects ‘Any Other Reason’ in ‘Reason’ drop down. 3. If deductor has Permanently closed his business, he should contact the Assessing Officer to close his TAN. If user has already declared that statement for Non-Filing. If user has changed the filing status of that statement from Non-Filing to Filing. User has to agree to all the declarations before submitting the statement for Declaration for Non-Filing. 4. Click proceed button after selecting required data. In next screen, you have to give a declaration/certificate as shown in the picture given below. 5. After certificate, following message will be shown. 6. Good thing of this facility is that you can change back this status from non-filing and can file return, if required at later stage or you have wrongly updated status for incorrect period. But change facility is available for only one time for a selected period. To change the status you have to go again through “Statement/Payments TAB after login > then declaration for non filing of TDS statement. 7. Statement selected earlier as “non-filing can be updated by selecting the statement for a given period and click change filing status, and in next screen, you have to reconfirm your request by clicking the proceed button. 8. After adding first statement to non filing status, next time you will get screen as shown above and you can add other statement to non filing status through add statement link. HI IF A NEW COMPANY NEEDS TO FILE NIL RETURN, IS IT POSSIBLE IN THIS WAY? Really helpful! Thank you! but, what’s the due date of filing/updating the status on TRACES website? THANK YOU! THERE IS ANY DUE DATE FOR FILING/SUBMITTING/UPDATING STATEMENT STATUS. There is no due date for filing/submitting/updating statement status. I am a house wife. I have no income. But I need to file returns. Pls suggest exact which form I need to fill as there is no source of income. If possible can I get a filled sample form for nil returns. Thank u so much for this information. Thanks a lot for such a good clarifications and informations. Search your TAN number on incometaxindiaefiling.gov.in under services. On traces, go for new registration. It will direct you to incometaxefiling website directly. Fill up the form and then go for activation. You can go for online TDS filing as well through TAN log in. What if it is related to section 24Q. TDS is not deducted. But if the staff needs Form 16 through NSDL, Deductor need to file TDS return. Can we file all quarter nil TDS return at a time and give salary certificate? Will there be any penalty for late filing? Can we file TDS return even after declaration for not filing return? Can I Upload TDS Return After Filing Declaration. If Is It Posible How Can I Prepare This. I have my personal TDS TAN account on TRACES website as a sole proprietor and I have been filing the “Declaration of non-filing of TDS Return” for some quarters. Now I have formed a new entity One Person Company Pvt. Ltd. and when I tried register that TAN on TRACES, it redirected me to efiling portal for finishing registration of TAN. After that I could login to the efiling portal but there is no option like the one in TRACES to submit a declaration for NIL TDS returns. I called IT Sampark Centre that manages efiling Portal but they also did not know. Would you know how to submit “Declaration of non-filing of TDS Return” on the efiling portal?